Ingolstadt, September 9, 2012 – Dynamic performance where the sky’s the limit – Audi introduces the RS 5 Cabriolet. The four-seat convertible with a cloth soft top entices with a unique combination of elegance and power. Its 4.2 FSI, a high-revving naturally aspirated V8 engine, outputs 450 hp. It accelerates the high-performance sports car from zero to 100 km/h in 4.9 seconds. 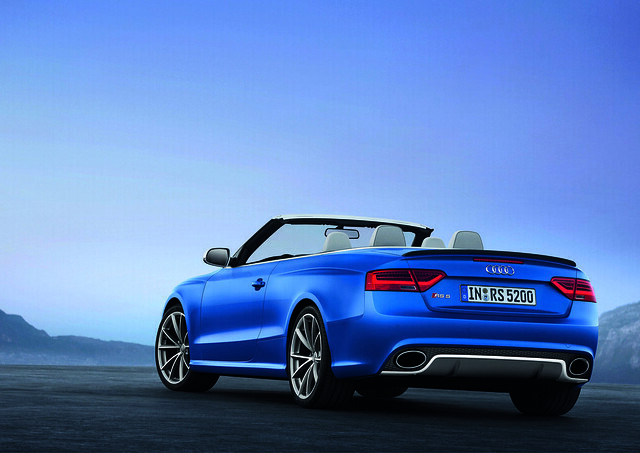 The Audi RS 5 Cabriolet will be launched in the Middle East in the second half of 2013. Prices and specs are not set yet. In the RS 5 Cabriolet, Audi dynamics takes on an especially beautiful form in the car’s flowing side profile with perfectly balanced proportions and sharp details. Matt aluminum elements, large air intakes embedded in the distinctively shaped front apron, wedge-shaped headlights with wave-light lower edges, elegant LED light strips at the redesigned rear bumper and a lightweight textile roof give the new Audi RS 5 Cabriolet a powerful and elegant look. A special foam layer in the roof – spanning over the spacious interior like a low curved dome – delivers high acoustic comfort. At the press of a button, the soft top opens and closes fully automatically in 15 seconds and 17 seconds respectively – even when driving at speeds of up to 50 km/h. It only requires 60 liters of its 380 liters total volume of the luggage compartment. The split rear seatbacks can be folded over individually, and a load-through hatch improves variability. The body of the Audi RS 5 Cabriolet is 20 mm lower than that of the Audi A5 Cabriolet. Eight exterior colors are available. As options, Audi can install a styling package in matt aluminum as well as an engine compartment design package that uses carbon fiber-reinforced polymer (CFRP) materials. A typical RS 5 highlight is its three-spoke steering wheel with flat-bottomed rim that is trimmed in perforated leather. The multifunction keys are intuitive, as are all other controls in the RS 5 Cabriolet. White numerals on black dials provide a strong contrast and are easy to read. The sport seats are upholstered in black or lunar silver Fine Nappa leather. All leather types are pigmented to inhibit heating by sunlight. The interior is styled in black, and the inner soft top liner can be ordered in the optional color star silver. Fine chrome highlights, understated high-gloss black trim and carbon inlays underscore the car’s dynamic appearance. Additional inlays are available upon request. The 4.2 FSI V8 engine outputs 450 hp at 8,250 rpm and produces a maximum torque of 430 Nm between 4,000 and 6,000 rpm. As an option, Audi can deliver a sport exhaust system with black tailpipe trim. The car’s top speed is limited to 250 km/h at customer request, Audi can boost this to 280 km/h. The powerful V8 has a combined fuel consumption of 10.9 l/100 km. The Audi RS 5 Cabriolet is equipped with the seven-speed S tronic dual-clutch transmission and launch control. The quattro permanent all-wheel drive system gives the RS 5 Cabriolet a decisive advantage in traction and stability. The chassis of the four-seat convertible is equipped with stiffer mounts and its anti-roll bars are larger and stronger. The standard wheels are 19-inch forged aluminum wheels in machine-polished ten-spoke design; 20-inch wheels in three attractive designs are available as options. The brake system employs internally ventilated and perforated discs in a weight-saving wave design; the front discs are 365 mm in diameter. Audi can deliver the car with carbon fiber-reinforced ceramic front discs and six-piston calipers as an option. The Audi RS 5 Cabriolet is delivered with an extensive set of standard features. All assistance systems offered in the A5 model lineup are available as options in the RS 5 Cabriolet as well.